Lula White of New Haven, a former Freedom Rider during the civil rights movement, will receive the Quinnipiac University Black Law Students Association’s (BLSA) Thurgood Marshall Award at 7 p.m.on Thursday, Feb. 25, in the Ceremonial Courtroom at the School of Law Center, 370 Bassett Road. 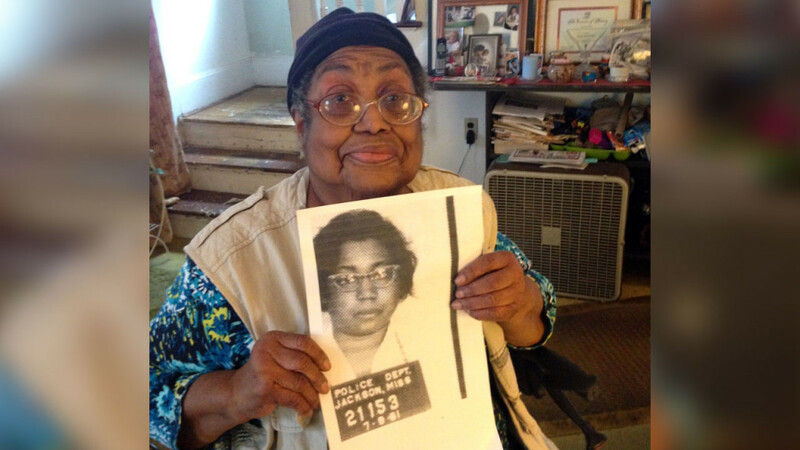 Lula White of New Haven holds the mug shot from her 1961 arrest. Lula White of New Haven, a former Freedom Rider during the civil rights movement, will receive the Quinnipiac University Black Law Students Association’s (BLSA) Thurgood Marshall Award at 7 p.m.on Thursday, Feb. 25, in the Ceremonial Courtroom at the School of Law Center, 370 Bassett Road. This event is free and open to the public. The Thurgood Marshall Award is given in honor of the first African-American to be appointed to the U.S. Supreme Court. Marshall epitomized individual commitment, in word and action, to civil rights. Each year, the BLSA recognizes an outstanding person in law, education or politics who exemplifies Marshall’s dedication to improving society through the advancement of civil rights, civil liberties and human rights. White was born in Eufaula, Alabama to parents who were farm workers. When she was young, her family moved to Birmingham, Alabama, and then to New Haven, where she attended Hillhouse High School. In 1954, she became a civil rights activist after reading an article about the Brown v. Board of Education decision, which ended legal segregation in public schools. As a result, she joined the school’s Human Relations Club and attended a rally at Yale University in support of Rosa Parks, Martin Luther King Jr. and the Montgomery bus boycott. After graduating from high school in 1956, she enrolled at the University of Chicago, where she earned bachelor degrees in education and social science, and a master’s degree in American history. She became a social worker in New York City and taught in the Chicago and New Haven public school systems for more than 30 years. While in college, White established a tutoring service for high school students in Chicago and served as the president of the university’s chapter of the NAACP. In 1959, she participated in the Youth March for Civil Rights in Washington, D.C. in an effort to put pressure on President Dwight Eisenhower to support integration of public schools. In 1960, she and other students picketed local stores each Saturday to show support for students engaged in sit-ins and other protests in the South. While teaching in Chicago in 1961, White joined the Freedom Rider movement after noticing a picture of southern segregation and a bus that was set on fire. At the end of the school year, she left Chicago for Nashville without telling her family and took non-violence training. She took a bus to Montgomery, Alabama, to join other Freedom Riders. When the bus stopped in Jackson, Mississippi in July 1961, White sat in a white-only waiting room and was told to move three times, but responded, “I have a constitutional right to be here.” She was arrested for refusing to leave and was taken to the local county jail. She was moved to Parchman Penitentiary, where she was subjected to an invasive cavity search, and remained there until August. Upon her release, White returned to Chicago to continue her civil rights activism. In 1962, she was arrested again for criminal trespass at the University of Chicago real estate office where she led a protest against housing discrimination. “Bernie Sanders, then an undergraduate at the university, organized and led the sit-in on campus. He also encouraged the graduate students to sit-in at the university’s real estate office to put more pressure on the university. I was one of the leaders of the sit-in at the real estate office,” said White. White participated in the March on Washington in 1963, and again in 1983, which commemorated the 20th anniversary of the “I Have a Dream” speech. White has participated in and held leadership roles for many organizations, including the New Haven Federation of Teachers, the Community Soup Kitchen, and voter registration drives in Chicago, New York and New Haven. White received an honorary doctorate of humane letters from Albertus Magnus College in 2010. She also has been honored by the African-American Historical Society, Southern Connecticut State University, New Haven Firebirds, the Greater New Haven NAACP and Perfect Blend Inc. in New Haven. She continues to advocate for civil rights, justice and fairness.